Use third party software, scripts, or bots, to access or play Zynga games in any way. Attempt to get free chips by clicking links from unknown sources or people promising free chips - this will get your account phished or hacked. Use profanity or language that discriminates or maliciously targets another individual in any way. This includes your profile picture. 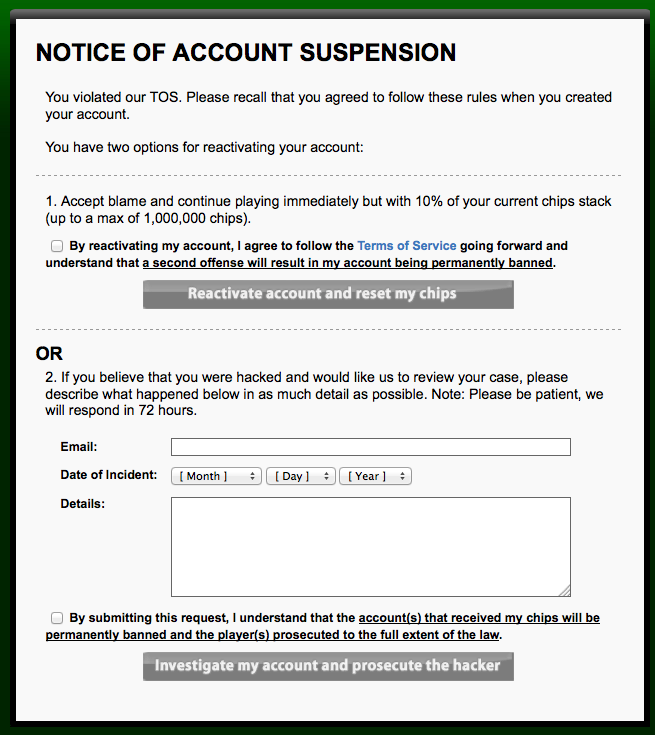 Create more than one account to play poker from or store chips - all accounts will be banned! Lose on purpose as a means of transferring chips - we can easily track this and you will be warned, have your chips taken, and banned! Sell Chips! Under NO circumstances is anyone permitted to sell chips. Attempt to buy chips from ANYONE other than Zynga - you may ONLY buy chips in-game via Zynga Secure Payment in the 'Buy Chips and Gold' screen or by redeeming a Game Card. You can reach out to our Zynga Poker Support team by sending an email to [email protected] to help you review your account. You can also check this link for more information about Suspended accounts. Thank you! akun saya kenapa tiba2 di blokir??? hi there, i am nelson here. my account suspended for 4 day+ and i still not receive any feedback from support team. i do send the email to support team regarding this. what should i do now? I did not break TOS and got banned for trying to login on my pc after I was having problems with ipad. On ipad ios 7.1 the tournament would not update for my winnings so I tried to login on pc. On pc every time I tried to access game it would say try again until finally I got banned or suspended. Please don't tell me I violated TOS because I did not. Something is wrong with Zynga poker and I would like to be reinstated now. Thank you. Conveniently for zynga it seems to be a growing trend..... I was on almost 13 million when my account was "suspended" for "tos breach", even though i did nothing wrong... I waited for my 3 days then was forced to admit i was wrong before i could play, then found that i only had 110k. I' am really angry about this and i am considering legal action against zynga. - Posting of Offensive or Infringing content – including chat posts that are threatening, abusive, pornographic in nature, excessively violent. This also includes use of Zynga proprietary images or indecent photos as your profile picture. As moderators, we don't have access to your game account to verify why it was suspended. I recommend that you email our dedicated Zynga Poker team to appeal the suspension on these following Zynga Poker channels: dedicated email [email protected] and toll free number 877-352-0893. Have a great day! Bought starting chips, played for so many hours at the table and poker league, once almost reached 1B, suddenly account banned! - I JUST PLAY POKER THATS IT! And now they only want to return 10% or max 1 mil of my chips without really hearing what i have to say or pointing to me what I did wrong?? Amazing.... where's the justice and consumer protection. This is really a scam and total rip off. Be careful and don't ever put money into any games from this company. Just report this to the credit card company you used to purchase chips and demand a chargeback. Hello Albert Saerong! I recognize how you feel after your account was suspended. As moderators, the option to check your gaming account is unavailable for us. The one's you mentioned are the common violations why an account is suspended. To have a better insight why your gaming profile has been suspended, I recommend that you contact our dedicated Zynga Poker team to help you review your account. For more information, you may check the article on this link. Have a great day! Hi Ahmad Fawaz Bash! I recognize how you feel with your suspended account. There are different reasons why an account is suspended. o Posting of Offensive or Infringing content – including chat posts that are threatening, abusive, pornographic in nature, excessively violent. This also includes use of Zynga proprietary images or indecent photos as your profile picture. As Moderators, the access to your gaming account is unavailable for us. If you would like to have a member of the Zynga Poker Support team review your profile, feel free to email our customer support team, however, we do not guarantee reinstatement. For more information, you may refer on this article. Thanks for your understanding and have a great day ahead! Now i'm going to share with you my problem with this Game . First of all i have to play this game like 2-3 years or so because when i'm trying to enter in-game a message appear to my screen and it says this Please help me to solve this problem . I really want to play again . Hi Chris, thanks for playing! Have you tried any troubleshooting yet? If not, we've a workaround here that might help solve your concern. Uhhm, look i have to play this game 2-3 years like i said .. Because this msg appears . I have even formated my pc (not for this reason) and installed any latest updates and nothing . As i see there are many banned users in this game, and i don't want to be one of them . So i am not able to understand what is really going on here . Please do something & thanks for the quick reply . If your account is suspended, you can fill-up the form that will pop-up after opening your game/account. For more information, kindly check here. My Poker Account has been banned.. I don't know what is wrong with my activities, coz I'm just regular fun player.. Anyone know how to reactive my account and why this happen to me? Anyone know where to report this at zynga? Hello Nassery Naz! I'm happy to assist you with your suspended account. There are many reasons why an account is suspended. Common violations made by players are chip transferring, posting of offensive content, conducting commercial activity, cheating or hacking. When your account is banned, you will see a Notice of Account Suspension banner in your game just like the picture below. You have options on how to reactivate your game. First is when you accept it but with an automatic reduction of your Chip stack (minimum of 10% of your current stack and maximum of one million). Second is to report a possible hacking incident on the form found on the said notice to initiate an investigation. The third option to contact our dedicated Zynga Poker team that can review your game profile. For more information, you may check the article found here. We appreciate your patience and understanding. Have a great day ahead! No.. I dont have suspended account.. I just had "Banned" without notice.. can't do anything to the game anymore.. I cant report this to zynga's.. I dont know what happen with this for next..
How to contact "Customer Support" when I click it just simple web report.. Thanks for getting back Nassery Naz! Is this the first time your account was suspended? Please note that some violations are irreversible. You can still reach our Poker team to review your profile. You can check the email on this link. Thanks for your patience and understanding. Have a great one! I never suspended or banned before.. I playing poker almost last 4 year.. nothing happen like this before.. but the things diferent today is I accept too many people who add me as a friend in the game.. I dont know if that is a violation for the game.. the next day I had my account have been banned like the picture.. I hope zynga team can review my account ASAP.. I know that you're excited to play the game again. If your account has been banned, please contact our customer support for further assistance. You may check this article for more information about your Support Options. Also, to know the possible reasons why your account has been suspended or banned, kindly check this link. I am having the same problem, too. Zynga banned me with no reasons. I am sure it is a bug / system error of zynga poker. It happened when after I had won a hand of about 80M in a 4M room ( i was playing with other 7 players). Zynga system counted me as having done a chips-transferer as I won big. Actually I was playing and zynga may learn it. I played long, got lost about 100m before, then I won about 80m, and it happened to me. I had a lot of PERMANENT ITEMS there. It is my only account on Facebook and Zynga Poker. Please help me solve the problem. Overall, based on what i have experienced and some other players' reports on this respected zynga poker community, i think zynga poker team should learn or trace the system bugs, especially on banning players issue. If zynga cannot fix the bugs, i think zynga will lose a lot of valuable and loyal players, especially who have played the game for a long time. It's up to zynga, and I am one of the victim. Thanks for sharing your feedback. To provide a safe and fair experience, the team is in the process of eliminating fraudulent activity and cheating in Zynga Poker. If you suspect someone is cheating, please contact us via email at [email protected]. You may also refer to this link for details. Regarding your account, please contact our customer support. They will further check this for you. Here's an article for more information about your Support Options. Glad to help you today. Regarding your banned account, please contact the Poker Team via email at [email protected]. Also, you may visit this link to find out more on how to further protect your account from scammers, phishers and online bad guys. i am a new player without any reason my account is banned how do i get it back???? You can contact the Poker Team via email at [email protected]. Also, to find out how to further protect your account from scammers, phishers and online bad guys, try visiting https://zynga.com/security . For more information, kindly check here.